the geordie times online (newcastle united archive fanzine): THE ARSE v THE TOON *** TOMORROW AFTERNOOON! Tomorrow we heed for the 'delights'? of "norf Landan" where we take on 'Wengers mob' in Islington. We aim to end wor shockin run of 'ne wins' in the last 8 weeks and the odds are stacked against us! A selloot 2,900 Toon fans will be there and they know that even a draw would seem like victory az we try and end the misery! The decision in the summer not to invest heavily iz now bearin 'rotten fruit' az quite simply yoo cannit survive in The Premyaa Leegue with 'Championship' players! Takeover talks are gannin on az we speak and anly a change of ownership will save us now! Pleeze god let it happen or else this 'winter of discontent' will anly get even more 'discontented'! 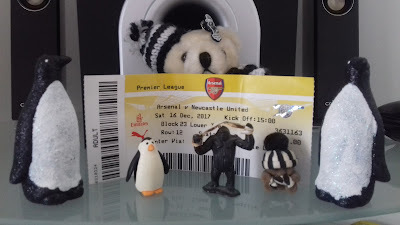 On a personal note, mee forst ever visit to London came way back in 1968 when NUFC drew with Arsenal 0-0 at their old Highbury groond and that result would de nicely tomorrow!----believe yoo me! A match report on that archive game 49 years ago will appear below here, sometime this afternooon and a match report on tomorrows game at The Emirites will appear here sometime on Sunday!